Hello friends! 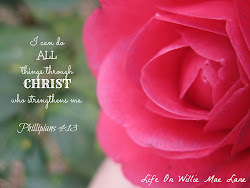 Hope you are doing well and enjoying your day. Today is Saturday, April 1st and I am at home sick. I decided to keep myself busy with a few little projects even though I feel terrible. 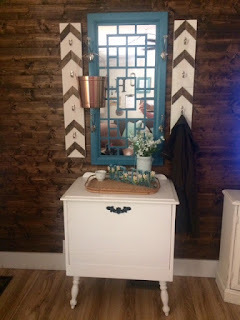 I have been wanting to put a different table under my hat/coat rack and mirror in the living room. I don't have a formal entry or coat closet in my home so I have to improvise. I decided to try this vintage record cabinet that I have had for a few years. It has been living in my craft room since I bought it home. You can see it in the photo below. It's the white piece beneath the blue framed chalkboard. I think I like it! The inside is perfect for stashing our flip flops as well. Anywho, moving it out of the craft room left a void....I can't have that now can I? This is after all, the junky room in my home. Every nook and crannie has to be filled! So, I remembered I had this little corner shelf that used to belong to my Granny Valentine. 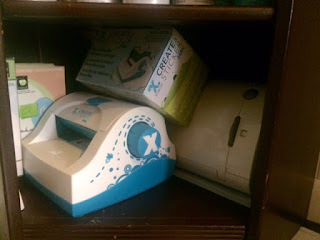 It was tucked away in the craft room closet so out it came to fill the space. I decided to store my paints in here as well as my Cricut and Xyron sticker machine. 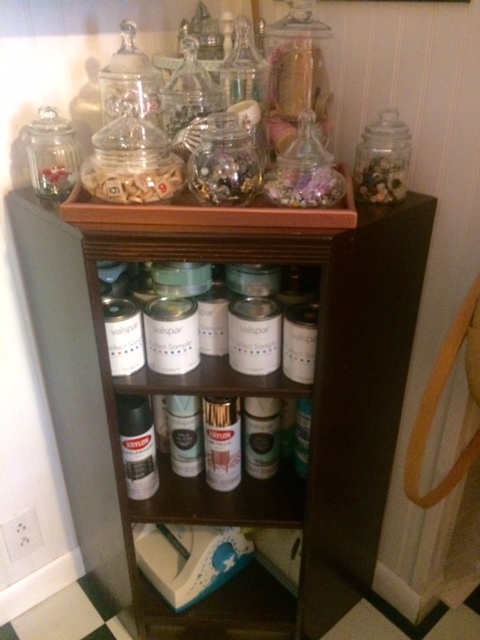 The top holds a few of my apothecary jars filled with odds and ends. 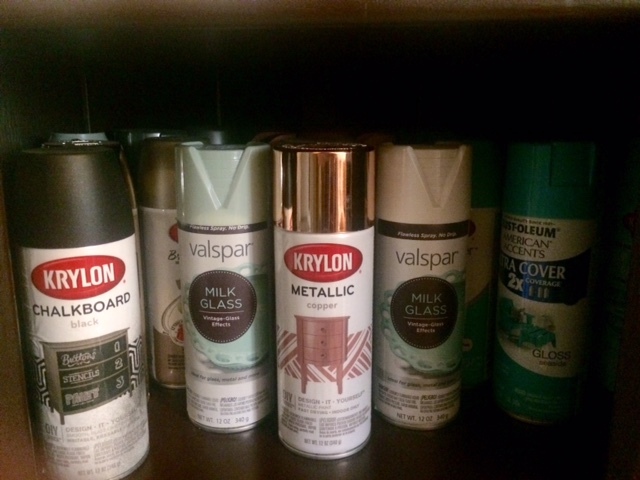 I think I will use some of that paint on the shelf soon. It needs to be brightened up a bit I think! 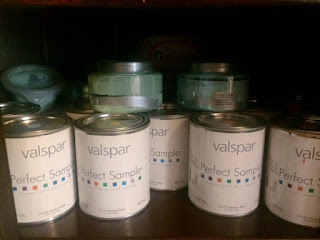 I think it would look neat to paint the outside white and each shelf a different color. We shall see....stay tuned....maybe over summer break! The record cabinet had about twice this many jars on it as this shelf holds, so I decided to empty some of them. I had this wooden jewelry box that I had formerly used as a tool box. I emptied it a while back and I was planning to donate it but something kept telling me not to get rid of it. I'm glad I didn't because it was perfect for this project. Sorry for the blurry photos...I didn't realize they were fuzzy until I uploaded them. You get the idea though! 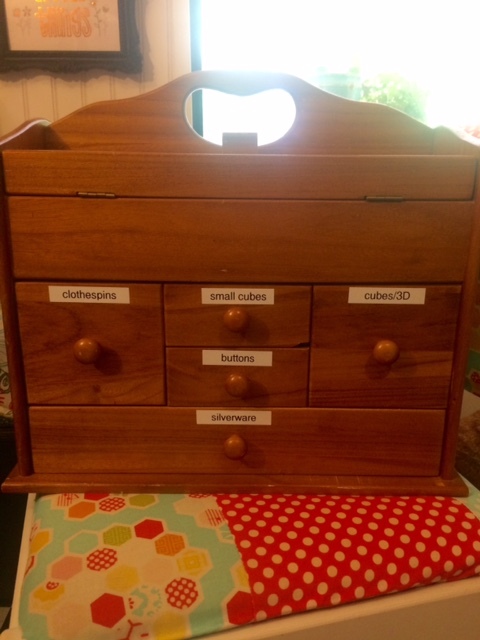 I filled the drawers and then labeled them. 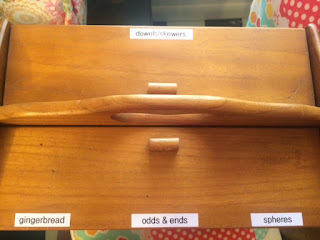 It holds lots of things...mostly wood items, but also my vintage silverware that I plan to make something out of one day. I did a little more cleaning and organizing in my craft room before I called it quits. I also updated my planner for next week. 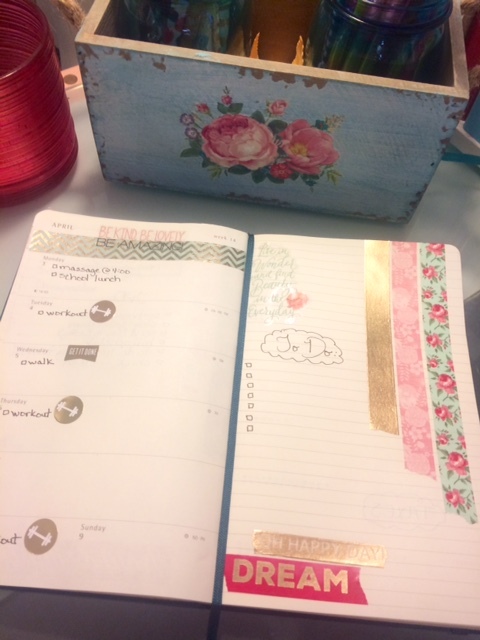 I like to add washi tape and stickers every week to make it pretty. I just noticed it matches my pretty box that holds my pens and pencils. And, that's a wrap! I'm off to find something to watch on TV. Maybe a good Hallmark movie! I hope you all have a lovely weekend. Get well soon, very soon. I love that record cabinet and it looks great in its new home. That wall is so pretty. I just saw one like that on Fixer Upper. A Hallmark sounds like a perfect thing to watch while waiting to get better. Hope you feel better soon. Teaching is a hard job when you are not at your best. I agree with Connie :). You really know a thing or two about organizing, and I can't believe you got all this done while sick! If I have as much as a sniffle, I'm a big baby. I hope your mom's soup is just what the dr. ordered! Glad to read halfway through your post that you were going to rest!! You are busy even when you don't feel good! But you do come up with great ideas and organization tips. I love the record cupboard by the door. It got me when you said you would store your flip flops in there. We are 3 months away from wearing them here!!! I hope you feel better soon. I like how the little cabinet works with the chevron stripped coat rack. It is fun to move things around and just make it feel fresh again. I've gotten rid of some of my glass jars also. Downsizing, it continues. Hugs and hope you feel better soon. Love that record cabinet!! Your craft space always looks so nice too :o) I hope you're feeling better. I was up at midnight the night before last with food poisoning I think... danged fast food restaurants!! The record cabinet looks great by the front door! I know what you mean about moving things around...the decorating shuffle. LOL. Hurray for getting rid of unnecessary stuff as well! Can't wait to see your shelf refreshed! I hope you feel better! How wonderful to have your mom to make you a favorite dish. Take it easy. You sure accomplished a lot, especially for not feeling well. I hope you are much better now. I saw your Mama's chicken and dumplings on IG...made my mouth water. I love that dish and haven't had it since my grandmother made years ago. I like the table at the front door and the corner piece in your craft room. 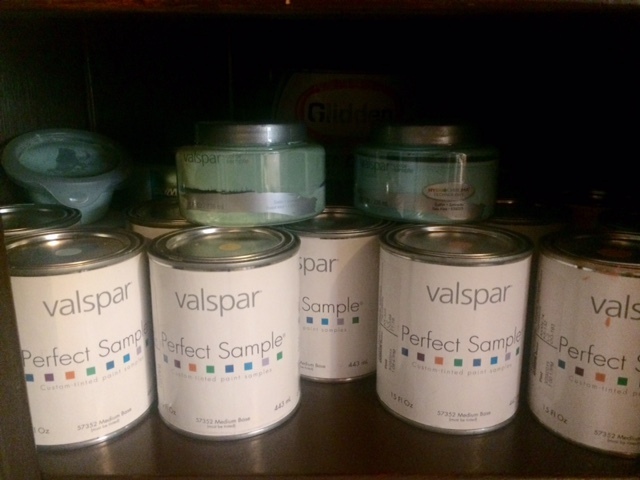 I think painting it white with different colored shelves will make a fun piece. Your redecorating looks great! I can't move the big pieces either, so I move the smaller stuff once in awhile too. I hope you are feeling better, Vicky. Chicken 'n Dumplings would make me feel better even if I wasn't sick! 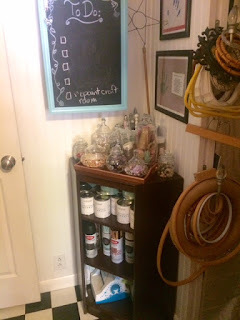 I like the piece you moved to create an entry area, and the little corner table you moved into your craft room is really sweet....I think it would look great painted white with different colors on the shelves...just sayin'! I have that same blue wooden box with the roses on the front...great minds at work in our "Happy Spaces!"